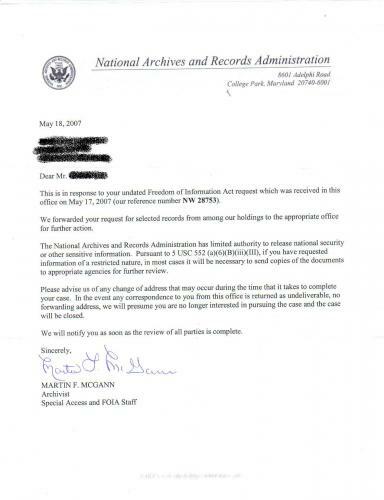 Under the “Freedom of Information Act”, I am able to request many things from the government. I would like a copy of “Production of Uranium Feed Materials”, and below is the correct formatting for such a request. Please be advised that I am prepared to pursue whatever legal remedy necessary to obtain access to the requested records. I would note that violation of the open records law can result in the award of court costs and attorney fees. Aparently this is being forwarded to the CIA for processing, as these are CIA films. OHNOES! Last edited by Bender on Sun Sep 21, 2008 2:26 am, edited 1 time in total. Why would he get on the terrorism watchlist? He's only requesting a pair of documents from National archives that have been made available through the Freedom of Information Act. It is pretty funny when you think about it though. A government agency makes top-secret videos and then (albeit eventually) turns them over to a public archive for public viewing/distribution anyway. A quick web search turned up a guy's site that has a full list of films that can now be requested from the NARA. Shame I'm in the UK really. I feel that 'The Sun' newspaper over here could learn a thing or two from top titles off this list like 'How Free Should the Press Be?' and 'Brainwashing'. Heehee! Mind you though, I see what you're saying with some of the titles like 'Spying for Uncle Sam - Part 1'! A footnote there is that they might charge you a reproduction fee! You'll have to let us know (if you're still around) if you here anything more on this one, Fireware!! That's why the people themselves need to find a way to get more power in order to improve government for the people by the people.